Great for recreation…whether you want to go for a light paddle, exploring, casual fishing or swimming, the Ocean Kayak Frenzy is perfect for you. 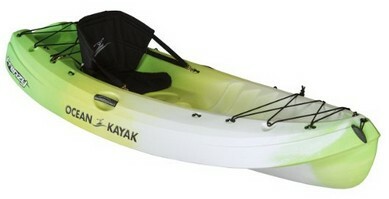 It’s an all-round recreational kayak which beginners can use with ease, including your children. Ideally suited for flatter waters, including mild rivers. This makes it an excellent choice for families. There are self-bailing scupper holes to stop the kayak flooding from water coming in over the deck. On very flat rides, when you are confident water will not come in over the deck, medium scupper stoppers can be purchased separately should you want to remain dry. Designed to maximize efficiency and minimize fatigue, the asymmetrical design helps you make good, clean strokes as you paddle. This Carlisle Day Tripper 2.3 mtr paddle is made from aluminum so its extra light, helping your arms. Because of its stability, it’s fairly easy to get back into the Ocean Kayak Frenzy should you venture off for a swim as reported by customers. The Ocean Kayak Frenzy has loads of storage room for fishing gear or scuba diving equipment if you’re feeling particularly adventurous. According to customers it also has plenty of legroom, so suits everyone, short and tall. If you are an extra-large kayaker, the 18” seat mold may not be wide enough for you.